Rubies are sandwiched between the diamonds on both sides. Shake the rod; the rubies are now above the diamonds. Squeeze the center diamonds. The rubies are back in place. Pull down on the rubies. They are now at the bottom. Flick the bottom of the rod; the rubies are back in the middle again. 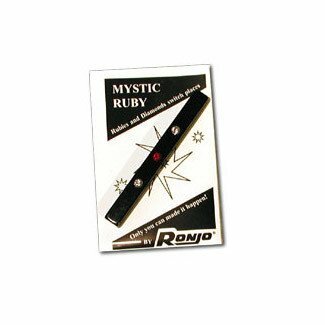 Slide the ruby on one side to the top and leave the other ruby in the middle. Can be examined. Tell them to move either ruby so that it is aligned with the ruby on the other side. No one else can do it.